Investment is not necessarily the same thing as installation of capacity, unless you assume constant price. 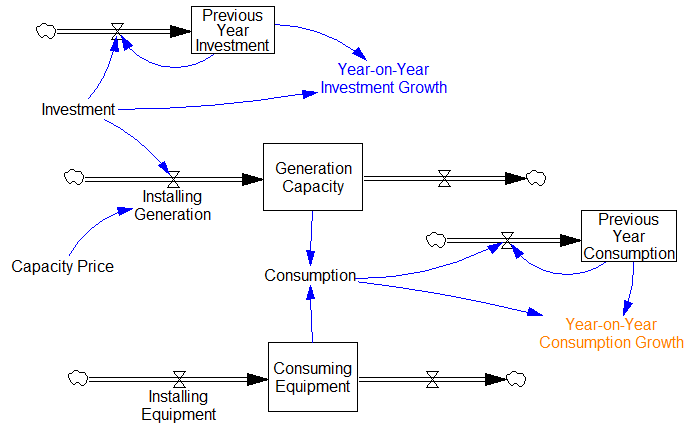 Consumption is essentially a direct function of stocks of consuming equipment and generating capacity, while investment is a flow. While there’s reason to expect growth rates of stocks and flows to match along a steady state growth path, this only applies in the very long term; in the short run, noise and disequilibrium will destroy any correspondence. The thing we do care about is the match between generating capacity and consuming equipment, but that depends on outflows (retirements of capacity) as well as inflows, so again the stock-flow comparison tells us nothing. There’s an additional level of indirection because we don’t see investment and consumption directly; the graph shows year-on-year changes. But that means that we’re seeing the slopes of investment and consumption, which tell us nothing about their absolute levels. So, it’s possible that investment growth is falling because it was much too high, and that consumption is growing because there’s excess generating capacity. 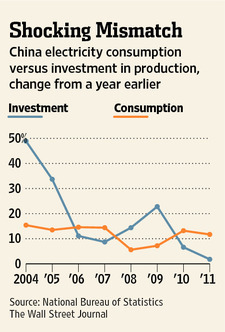 The best you can say about this graph is that it doesn’t contradict the article; otherwise it’s almost completely uninformative about the true state of the Chinese power system. 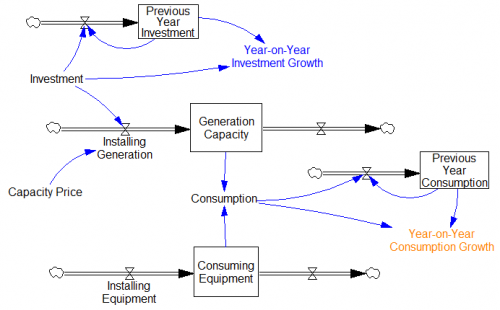 It would be far better to have a direct comparison of generating and consuming capacity, or perhaps the growth rate of consumption (which is the net flow of consuming equipment) vs. investment in absolute terms. 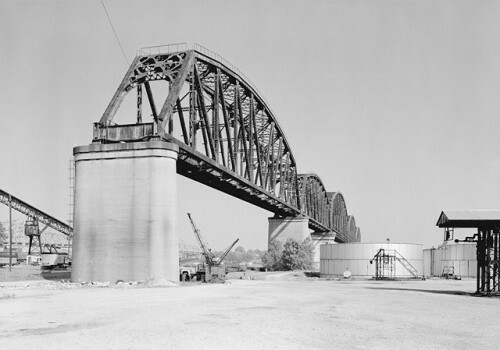 Author TomPosted on February 3, 2012 September 22, 2017 Categories Climate, energyTags gas1 Comment on Gas – a bridge to nowhere?